Turkey will facilitate the passage of Iraqi Kurdish Peshmerga fighters to the besieged Kurdish city of Kobani in northern Aleppo, the Turkish Foreign Minister Mevlut Cavusoglu said Monday, reported Turkish newspaper Today’s Zaman. Masoud Barzani, the president of Iraqi Kurdistan and the head of the Peshmerga, reportedly coordinated the plan with the PYD, the Syrian Kurdish group in Kobani, reported the Kurdish news agency Rudaw Monday. Meanwhile, US planes delivered “weapons, ammunition and medical aid” via airdrops to Kurdish forces in Kobani Sunday night, said the US Central Command in a press release. An official spokesperson for the Kurdish forces in Kobani confirmed the US airdrop in a statement Monday. The military supplies were “provided by Kurdish authorities in Iraq” and “intended to enable resistance against ISIL’s [Islamic State] attempts to overtake on Kobani,” according to the US military. Despite the fact that US military says that airstrikes have killed “hundreds” of IS fighters in Kobani, Islamist fighters have still managed to advance towards the city center, reported US-funded news agency Al-Hurra Sunday. Rebels with the Al-Umri brigades, part of the moderate Syrian Revolutionaries Front, killed pro-opposition media activist Qaisar Habib in Daraa province on Sunday to avenge Habib's killing of the head of Al-Umri brigades Qais Qataina in late August, reported the Syrian Observatory for Human Rights. Habib's harsh, public criticisms of Qataina culminated in an armed confrontation near the town of Jilin August 28, in which Habib shot and killed Qataina before being wounded by the latter's guards. 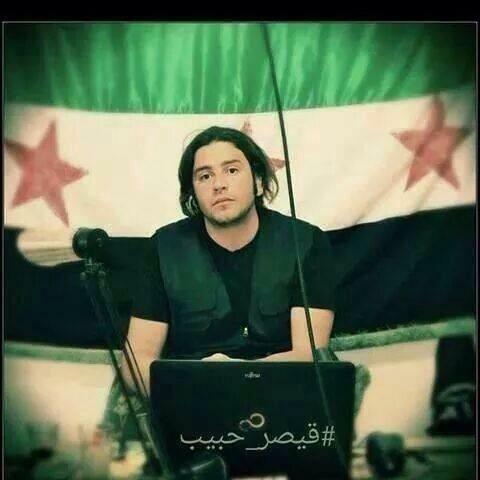 Pro-opposition media activist Qaisar Habib was killed by moderate rebels over the weekend. Photo courtesy of @m2aln. Habib was receiving treatment at a hospital in Daraa when he was killed, awaiting trial in a sharia court for the killing of Qataina. This, while Amar Abu Shahin, a pro-opposition media activist, protested that the Al-Umri brigades had overstepped the court tasked with bringing charges against Habib, in comments quoted by pro-opposition news network All4Syria. The Syrian army took control Sunday over Zamlaka bridge, the primary supply line between the rebel-held East Damascus neighborhood of Jobar and the predominantly rebel-controlled suburbs of East Ghouta, reported Iranian pro-regime channel Al-Alam. The operation against Zamlaka bridge is part of a regime plan to isolate Jobar, the closest rebel-held territory to the center of Damascus, from East Ghouta, and then capture the neighborhood. As of publishing, rebels are resisting regime attacks to storm Jobar and the adjacent town of Zamlaka, reported pro-opposition Masar Press, as the Syrian army has stepped up surface-to-surface missile attacks on both areas. A water shortage in the regime-controlled city of Hama is quickly turning into a full-blown water crisis, as residents in several neighborhoods have not received water since last Thursday, said the media branch of the grassroots opposition group Hama Revolutionaries Union Sunday. The neighborhoods suffering the most from the shortage are those situated on top of hills, where it is more difficult for pipes to transport water, according to the Union. Local opposition groups blame the Assad regime for cutting off access to water, reported pro-opposition news outlet Step Agency News, but the exact reason for the shortage is unclear. A mix of pro-opposition and pro-regime residents live in the neighborhoods facing the water crisis. Official government media has not offered a reason for the water shortage.